Delivering impeccable B&W document quality with 1200 x 1200 dpi print resolution at up to 95 ppm, the bizhub PRO 951 is a model of speed and efficiency sure to keep your business humming and clients happy. Armed with high paper and toner capacity, this digital printer gives you increased productivity – with less operator intervention. 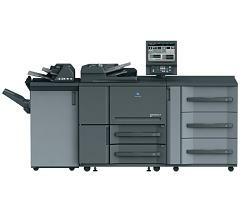 And, you’ll save space with its standard built-in print controller, and save time with lightning fast job processing. It’s the digital age’s ideal printing solution. To be successful in today’s ever-changing world, you’ll need the tools to get the job done quickly and effectively. Boasting speed, power, and productivity the bizhub PRO 951 is that tool!